The Woodman takes the calendar and runs. It’s a minor detail, from a book that focuses on 46 films rather than 80 birthdays. Still, in what may amount to an early borough channeling of the same spirit that courses through everything from 2006 self-help tome The Secret to Oprah’s eternal belief in the power of positive affirmation, author David Evanier uncovered a fascinating tidbit for his new biography of Woody Allen. Here’s the kind of discovery that biographers love: Woody Allen’s boyhood pal Jerry Epstein, now a psychiatrist and author, told me that Woody’s birthday is not really December 1; it is November 30. “But Woody wanted to be Number One,” Epstein said. A.k.a. Take the Calendar and Run. Evanier had a lot of email correspondence with Allen while writing the book. That conversation eventually led to one face-to-face meeting, which the author writes about in that same post. One additional point of note is that during the meeting, Evanier gave Allen a copy of his 2006 novel The Great Kisser. Allen, after promising to read the book while traveling to Cannes that year, did just that and sent his comments to Evanier within a week of returning. Pretty impressive. 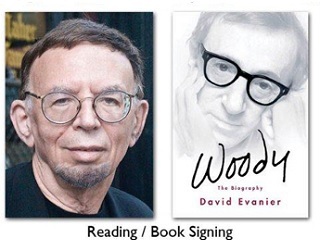 In the latest review of Woody: A Biography, Washington Post pop culture writer Jen Chaney suggests it might be time for another female writer to tackle the book topic of The Woodman’s life. In the meantime, the Evanier tome is definitely worthy of holiday shopping consideration for anyone with an Allen fan on their list. Allen, with the given name Allan Koenigsburg, was born in 1935 in The Bronx and raised in Brooklyn.